Open to all existing subscribers who will refer a friend to subscribe to any of our services. Subscriber can refer as many as he/?she can. The subscriber will get Php200.00 discount on his or her monthly fee for every installed referrals within the promo period to be credited on his or her next billing statement. Note: Only Php200.00 can be credited per billing statement. Discount are not convertible to cash nor transferable. 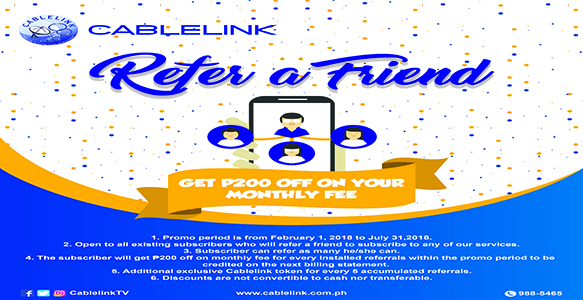 Cablelink employees and their relatives up to the second degree of consanguinity and affinity are ineligible to join the promo.